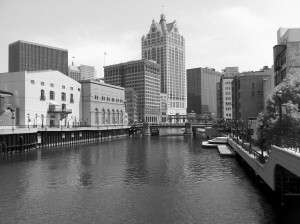 After an enjoyable and motivating day and a half visit with photographer David Plowden and his family in their home near Chicago, I moved on to Milwaukee, checking out towns and the shore of Lake Michigan along the way. I’ve spent the last day and a half exploring Milwaukee by car and on foot. It is an attractive and quite vibrant city. Given the extent of loss to its industrial base in recent decades, the level of energy in the city surprised me. I was happy to find that the majority of the waterfront – for recreation as well as industry – is not cordoned off for private use, as is so often the case in Connecticut and other parts of the northeastern seaboard. Beautiful parks and beaches along Lake Michigan and ample access to the rivers and channel in the city as well. Today I will head north toward Green Bay in search of farms and farmland. So far, no signs of violent storms or tornadoes – but I’l keep my eye out for them! My trip is underway! Photographing primarily urban subjects so far – but that’s about to change.